Did the Hare Bully the Tortoise? Home → Classroom Management → Did the Hare Bully the Tortoise? The hare is chock full of confidence to the point of bragging all the time and annoying not only the tortoise, for being slow, but also getting on the nerves of all the bystanders. It is the tortoise who challenges the hare to a race. The race begins and the tortoise does not waver from his course, slow and steady, while the hair zips back and forth and even stops to take a nap – which eventually leads to…. The tortoise wins the race! We’ve all probably heard this story before but I remember my meditation teacher, Tulshi Sen, talking about this story describing some of the more subtle points in it. For instance, how crazy is it for the tortoise to challenge the hare to the race? Before the race started do you think anyone believed the tortoise would really win? This story was told by Aesop likely somewhere around 600 BC. This was well before “bullying” had been invented. But I think that hare actually fits the criteria of a bully – showing off in front of others and making fun of the tortoise because he’s slower – there was definitely bullying going on there. That tortoise had to really believe in himself to break free from the tormenting hare. What if he didn’t win? What would he be in for then? But he took the leap of faith and believed in himself. I told the story of the Tortoise and the Hare in this class because one of the mom’s told me her son had trouble with a bully at school. She had talked to the school about it and they were also working on it there. But she also wanted to help her son build his self-esteem, confidence, and feel better about himself. Stories, meditation, and yoga can help kids understand that true power comes from the Spirit, which is Consciousness. If we feel in our heart what we want and believe we can have it, we will not waver. The hare may zip ahead of us, come back and run circles around us, and even taunt us – but when we are sure of ourselves we can stay on our course, we will not waver. “That is the secret of the power of detachment. Just hold the vision. to be experienced by your five senses. Your heart has already experienced it. For a seven year old boy being bullied, this means finding the courage in his heart to vision happiness and believe he deserves it. Believing it even if he feels like everyone else thinks he’s crazy and is against him. It’s difficult to tell a child this is true, but when they hear it in a story, that the tortoise believed in himself, did not waver, and won the race, it touches something within. Stories are powerful tools for all ages. 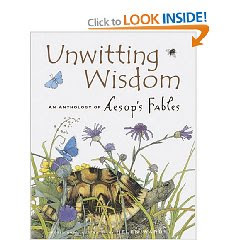 Those like the Aesop’s fables, the seven stories in Ancient Secrets of Success for Today’s World, and other uplifting stories bypass the intellect and touch the heart. Stories like the Tortoise and the Hare help kids believe that they can win the race too. After all, if a tortoise can do it, why can’t we? P.S. Congratulations to the winner of the Yoga DVD by Hemalayaa, Yoga for Everybody: Bryan from At Home With Dad. P.S.S. Kids Yoga Teacher Training: Two of the stories from Ancient Secrets of Success for Today’s World are covered in my Kids Yoga Teacher training. There’s a complete class theme and yoga poses for each story. The early registration deadline has been extended for the course, I would love to see you there so you can see how easy it can be to use stories in yoga class. Click here for details. Hi Tania – thanks for the comment. It was a fun kids yoga class to teach on the hare and the tortoise. Love it! Thanks for sharing! I believe!